Meatballs of all sorts have become one of my go to entertaining dishes, so for my sisters bridal shower I decided to do meatball sliders. I used my same turkey and chicken meatball and tomato basil sauce recipe that I used in my older post Meatballs!! 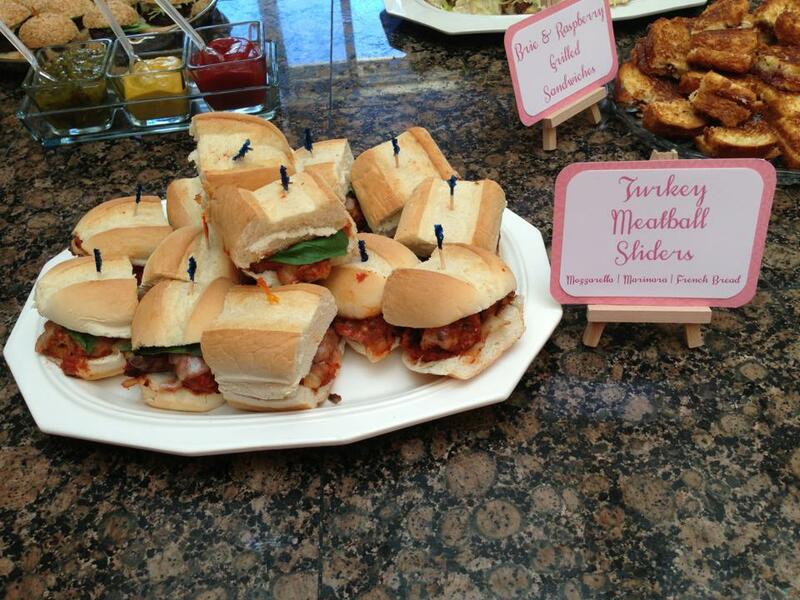 but instead of serving them with pasta I turned them into mini sandwiches. Following the directions from the Meatballs!! post after both the sauce and the meatballs are ready combine them and cover the meatballs in the sauce. If you are making this ahead of time now let them cool a bit then store in the refrigerator until an hour before you are ready to serve them then reheat over low until hot all the way through. You can also reheat them in a slow cooker over low just add a little water and change to the keep warm setting, this is how I prefer to do it. As the meatballs are reheating slice fresh mozzarella cheese. Preheat oven to 400. To create the sliders cut the meatballs in half and spread out on a sheet tray covered in tin foil and sprayed with cooking spray. Put the mozzarella on the meatballs and into the oven until the cheese is melty 5-10 mins. I couldn’t find slider sized french rolls but that is what I would recommend using or you can do what I did and cut up regular sandwich french rolls into thirds, place the meatballs and cheese on the rolls and garnish with a fresh basil leaf. Enjoy! I had never made pulled pork before so I looked at a few different cookinglight.com recipes before combining a few to create my pulled pork sliders and coleslaw recipe for my sisters bridal shower. I ended up modifying the rub to be closer to what I use for barbecued chicken by adding garlic powder and onion powder and not using smoked paprika, that most recipes called for but I just do not like very much. This is a great party or casual dinner party meal because you can make it ahead of time and then leave it on warm until you are ready to serve. Combine and mix all the ingredients for the rub. Rub the rub mixtures all over the pork shoulder and let sit for at least an hour. After the pork has absorbed the rub, heat a large skillet over medium high heat and brown the pork on all sides, cooking each side for 3-4 minutes. In your slow cooker combine and mix the cooking liquid together, place the pork in the slow cooker and cook on low for 7-8 hours or until tender and falling apart. Remove the pork and strain the cooking liquid into a saucepan, slowly let the cooking liquid reduce until thick like a barbeque sauce. 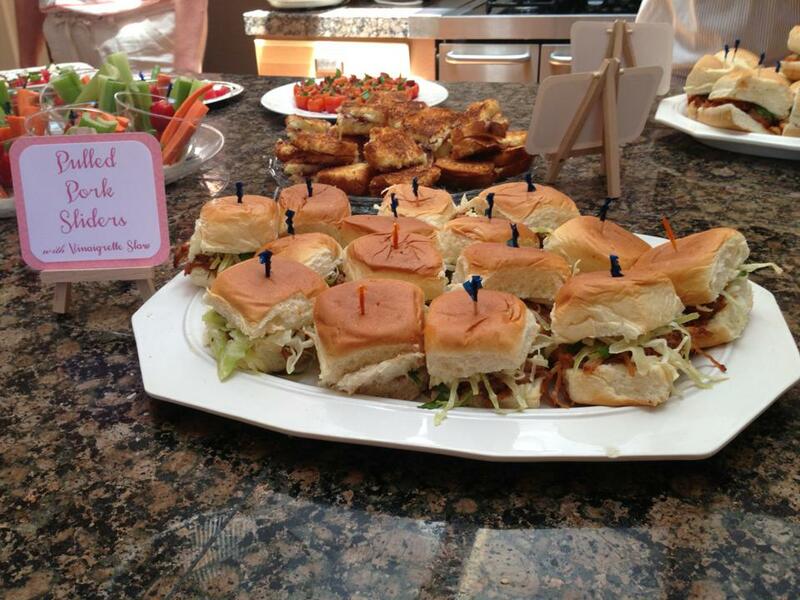 Serve on slider buns with sauce and coleslaw, recipe below. In a serving bowl add lemon juice, vinegar, and honey whisk until combined, continue whisking and stream in olive oil. Add parsley and salt and pepper to taste. Add coleslaw to bowl and toss to dress. Meatball Sliders | c… on Meatballs!! Dinner Party with my… on Taco Night!! !